Pablo Picco is an Argentinian musician, known most as a member of O+yn (Omasin), a post-form improv quintet, active from 2008 in the Psychedelic folk scene, with various releases on labels like Ikuisuus, Taping Policies, Lal Lal Lal, etc. In 2012 Pablo Picco and María Victoria Arener traveled through the chaotic hinduist faith cities (Varanasi), zones of strange asian mixed cult (Bhubaneswar), lonely and romantic woods (Darjeeling), breathtaking introspective buildings (Kathmandu), and many other vibrant and unknown places, filming and recording their experience. 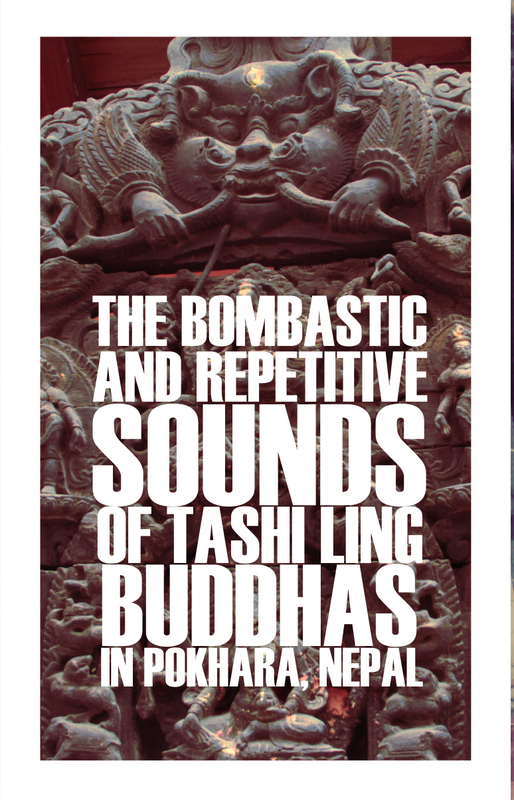 “The bombastic and Repetitive Sounds Of Tashi Ling Buddhas In Pokhara, Nepal” is a sound mix of Pablo Picco and María Victoria Arener’s trip. The first side is inclouding field recordings by the Buddhis ceremony in Pokhara Nepal, that took place on the 6th of February, 2012. Side b includes various recordings from river, caves and a wedding band, recorded on the same day between 10 AM and 18 PM. The cassette include a 40min mix of their experience, and absolutely ethnological document, that is already documented as a full length experimental film under the name “Kalinga Utkal”. A sound mix of field recordings from Pablo Picco (of folk experimentalists Ø+yn) and María Victoria Arener’s 2012 India trip, the cassette specifically composed of recordings taken in Pokhara, Nepal on February 6th of that year. A film, titled Kalinga Utkal, documents a larger portion of this trip, and sees them go through Indian cities like Varanasi, Bhubaneswar, Darjeeling, and Kathmandu, to name a few. Side A, for the most part, documents a Buddhist ceremony, the main excursion of that day. Apparently, it was a bit treacherous to get there—dark, foggy, and ambiguous roads were navigated by motorbike—, but the recording captures a “Happy Holy” day and is full of temple-filling glottal drones, hemmed by a subtle syntax and adjacent bells and gongs. The B side captures the rest of the day with horns and percussion from a wedding band and other ambiences and distant voices around the Pewa Tai Lake. The drifting ambiguity as to what is a field recording and what is a ceremony documentation makes the whole thing float on its own, a pleasure even without context. Something for fans of similar slightly ambiguous field recording mixes from the Discrepant label.